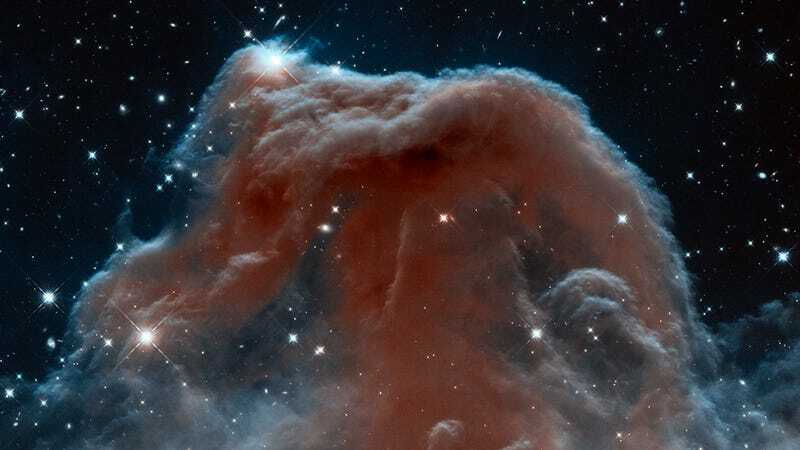 To commemorate the 23rd anniversary of the Hubble Space Telescope, NASA/ESA has released this gorgeous new image of the iconic Horsehead Nebula. We've seen this stunning nebula before, but never quite like this. It's located in the constellation of Orion (The Hunter) and features massive plumes of gas in the infrared. The nebula, which will completely disintegrate in about five million years, was formed from a collapsing interstellar cloud of material. The updated image was taken in the infrared light with the Wide Field Camera 3, which was added to the Hubble in 2009. More at Hubble Space Telescope.